Melvyn Bragg discusses the life of Siddhartha Gautama, the originator of Buddhism, and examines why his teachings have now become one of the fastest growing religions of the Western world. 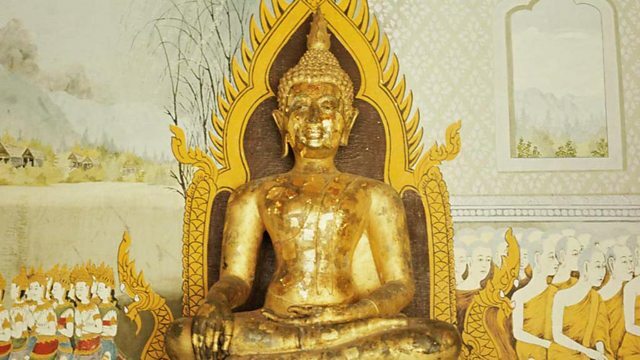 Melvyn Bragg and guests discuss the life and teachings of The Buddha. Two and a half thousand years ago a young man meditated on life and death and found enlightenment. In that moment he saw his past lives spread out before him and he realised that all life, indeed the very fabric of existence, was made of suffering. That man was Siddhartha Gautama but we know him as The Buddha. He taught us that we have not one but many lives and are constantly reborn in different forms according to the laws of Karma: an immortality that binds us to a cosmic treadmill of death, decay, rebirth and suffering from which the only escape is Nirvana. Buddhism was quickly established as a major religion in South East Asia but now two millenia later it is one of the fastest growing religions of the Western world. Why has it captured the spirit of our times? Is it because there is no compulsion to believe in God? And what is it that Western converts hope to get from Buddhism - truth and enlightenment or simply a spiritual satisfaction that Western religion cannot provide? With Peter Harvey, Professor of Buddhist Studies at the University of Sunderland; Kate Crosby, Lecturer in Buddhist Studies, SOAS; Mahinda Deagallee, Lecturer in the Study of Religions, Bath Spa University College and a Buddhist Monk from the Theravada tradition in Sri Lanka.